Hip Hip Hooray! Special thanks to Jean at Fallen Archangel for all of her hard work. She just rocks… Check out our two angel buttons on the sidebar and feel free to grab them. 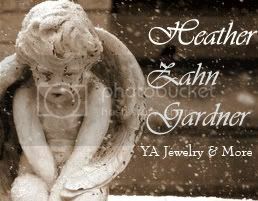 They will link to Heather’s Etsy shop with YA jewelry, photography, our music CD and journals. Now we just need a button with code for our Fire and Ice logo with the words written on it and small enough to fit on the side bar. If anyone out there could write us the codes for these and send them on we will be forever grateful! So, we are giving away a free copy of Jessica Bendger’s new book “The Seven Rays” to anyone who would like to make us new buttons with code. Comment below to win.